Recently I’ve decided that my company needs a cloud PBX system for my project. We’ve launched new services aimed at B2C audience before the company served the B2B segment only. This led to many changes in business processes, one of the most notable — people started calling us! We are just a startup, but we have customers worldwide, so we needed a solution that would allow us to accept calls from multiple locations and call back. Last but not least, we were tight on a budget. Disclaimer: I did not know how this VoIP thing should work before our B2B customers did not call us, so we had to build everything from scratch. If you find that we’ve made a mistake at any point of our analysis of available solutions — feel free to post your how-to advice in the comments below. At this stage, we needed to make sure these are popular tools with lots of users, reviews, as we did not want to rely on recently released and poorly-tested software for building a relationship with users of our brand-new services. Vonage has a wide list of tools it can be integrated including Salesforce, Office 365, ZendDesk. RingCentral has fewer integrations, but still covers all categories you may need from infrastructure to productivity. Zadarma integrates with different CRMs, including my favorite Zoho, and even messaging apps (FB messenger, Slack, Telegram). This is handy as you can send alerts there, for example, set up notifications about missed calls. OnSip supports only five third-party tools: HighRise, Odoo, ZenDesk, Slack, and Chrome (though, it is just an extension for a browser). Developers of Jive has implemented six integrations, and promise to add three more, including Office 365, Microsoft Dynamics and Dealer Sockets soon. Once again, we needed a cloud PBX for a new business venture; this is an experiment which may and may not work out. So, we did not want to invest significant money for building infrastructure. Vonage’ basic version called “Mobile” (no desk phones) starts from $19.99/mo. 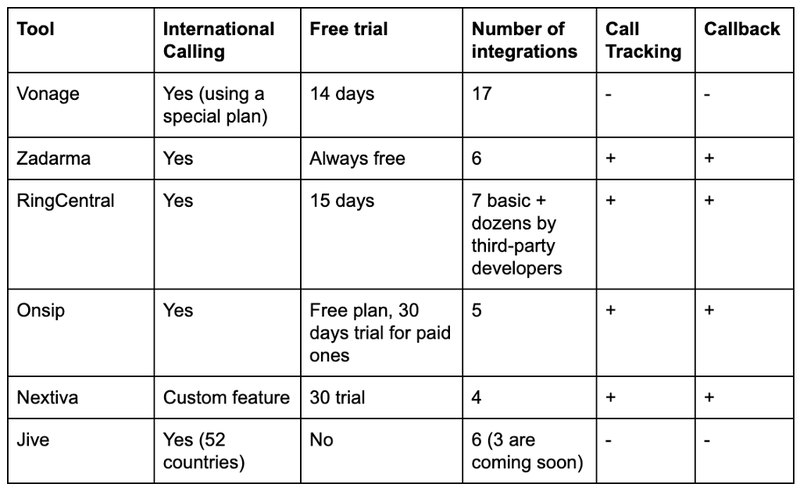 Here you will get unlimited calling (U.S. and Canada only), but not analytics and integrations. If you want to integrate it with your CRM, you’ll need the Premium plan for $29.99/mo. The basic plan for RingCentral is $19.99 per user per month if paid annually (monthly fee is $29.99) with a toll-free or local number and 100 toll-free minutes included. Zadarma PBX is free to use. They charge for extended storage for recordings and minutes. Virtual numbers, including 1–800 toll-free ones, are available for dozens of countries almost at no cost (connection may be free or paid, the monthly fee is usually $3–5). Unlimited plan is $18.95 per person per month (includes a desk phone or headset for every user which we did not need). They also have free plan with internet-only voice communications. Jive uses tiered pricing depending on the number of users. The basic plan is $29.95/mo for 1–4 users. For now they are offering GoToMeeting Pro License with every Jive seat which may be a plus. Nextiva’s basic plan provides you with Cloud PBX, call management functionality, free local and toll-free number for $19.95/mo. Although the price was a crucial factor for us, we’ve also analyzed the overall functionality of the PBX systems, offered by services we reviewed. Vonage has a pretty big list of features divided by categories like privacy, customer service, personalization or work on the go. RingCentral offers High-definition (HD) voice feature even in its good basic plan. With Zadarma you can record calls and install voice menu (IVR) right out the box even in their basic free version. Onsip offers essential features and some advanced one like enhanced music on hold. From Nextiva’s features I liked, there is voicemail to email and call queuing worth mentioning. Jive has multiple functions as well, as a business owner I was interested in spy mode, which allows an administrator to enter an existing conversation silently without interrupting an ongoing call. Conversation participant does not know you are listening, so you can gather data about the quality of work of your employees. Our b2c segment has users from different regions. So we needed to accept calls from, at least, USA, Eastern, and Western Europe. We also wanted to use a call tracking — there were plans to launch several ad campaigns, so we needed to know which marketing channel has generated the lead. Callback widgets and other stuff could be an advantage as well, though we did not need it at the beginning. No-hassle international calling was offered by Zadarma (they have the biggest selection of regions for purchasing numbers), Vonage has a special plan for international calling, OnSip has an extended calling are (rates are here), you need to contact Nextiva in order to set up international calling, Jive supports 52 countries. OnSip, RingCentral, Zadarma, Nextiva offer call tracking function. Jive and Vonage do not provide this feature. OnSip, Zadarma, RingCentral, Nextiva also offer to call back widgets, so that your customers can request a call from you. I failed to find information about the callback widgets on Vonage’s website (though they have a nice feature called CallReturn — you can call back to the last caller by dialing a unique code). The same applies to Jive — I did not find any mentions of call back feature on their website. That’s it, hope this post will be helpful for those who, like me, have faced the task of choosing a PBX for a startup for the first time. Choosing A Cloud PBX: Six Tools Comparison was originally published in Hacker Noon on Medium, where people are continuing the conversation by highlighting and responding to this story.